Just about a month ago, we wrote about IntoNow, a new service that allows you to tell your friends what television shows and movies you’re watching in realtime. But unlike other media “check-in” services, you do this simply by hitting a button and letting your phone listen to what you’re watching. It’s awesome. Really, really awesome. Others seem to agree, as today IntoNow is announcing that they’ve already hit a million shows/movies tagged in a month. They’re seeing an average of about a show tagged each second, with a peak of 17 tags a second during primetime hours, co-founder Adam Cahan says. But the most interesting thing so far about the service may be the data they’re collecting about how people are consuming media. As you can see in the charts above and below, the one million tags have already given IntoNow some good information. For example, 57 percent of users are watching shows time-shifted (meaning recorded and watched later or viewed on-demand). The things not time-shifted are generally news, sports, and events (all of which are obvious). 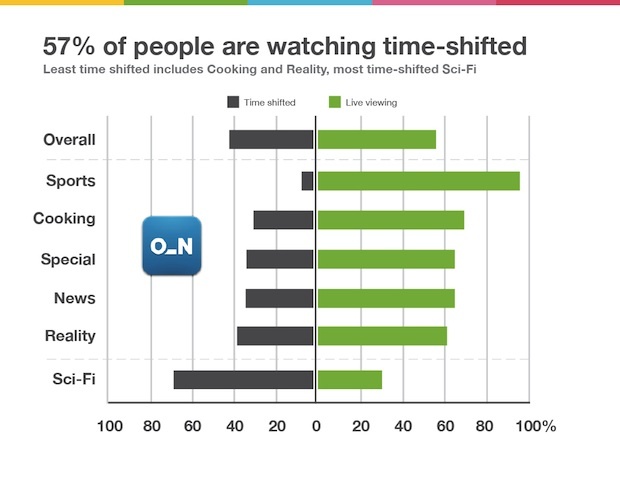 But a ton of people also watch cooking show and reality shows not time-shifted either. On the other end of the spectrum, a ton of sci-fi viewing is time-shifted viewing. Read into that what you will about geeks versus regular folks. 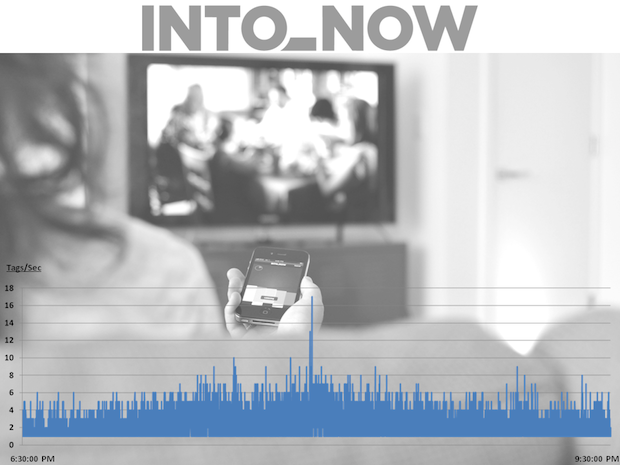 Of the IntoNow users, 79 percent are using it for television content versus 14 percent for movies. 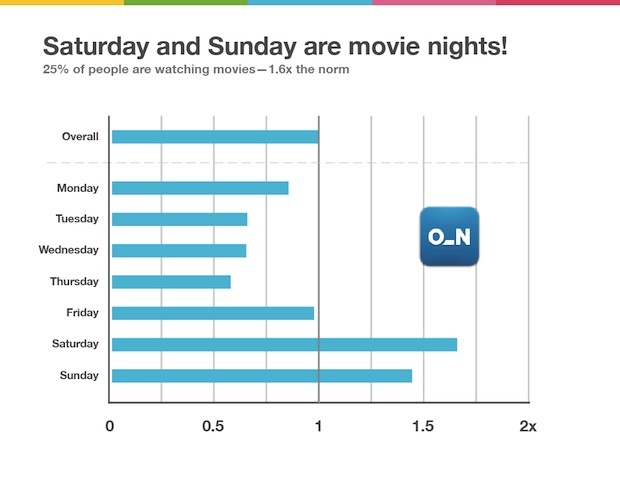 That shouldn’t be too surprising either though given that IntoNow only focuses on older movies for the time being. 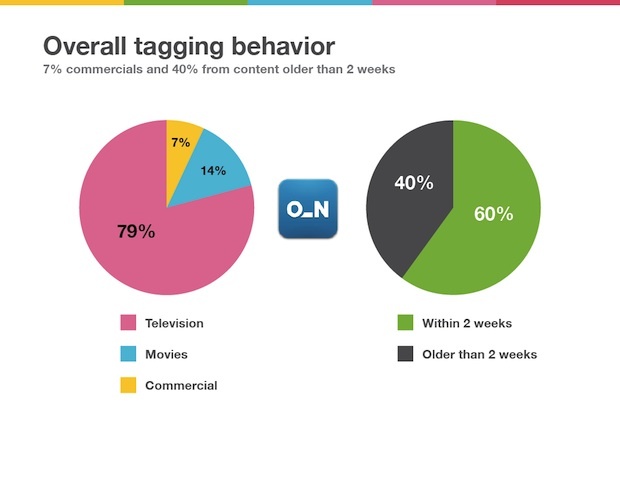 More interesting is that a full 7 percent of tags are used to tag commercials. Among TV shows, people seem to love sitcoms. 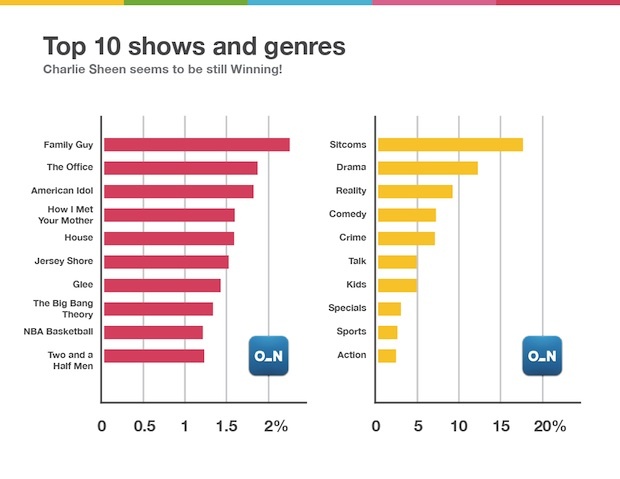 And yes, Charlie Sheen’s former show Two and a Half Men made the cut for most popular shows — but Family Guy is tops overall. Given that rival Clicker was just acquired by CBS today, I asked Cahan for his thoughts on the current state of things. “The space is definitely exciting/fast moving, and we’ve not seen the end of the combinations. There are some really big industries and companies being impacted. Device/mobile/web/tv are colliding around consumers shifting behaviors,” he says. Cahan also notes that Clicker founder Jim Lanzone will be a great fit for what CBS Interactive is trying to do.